I don’t know why but my kitchen shelves are always piled up with dried lentils in all sorts of different colours, red, yellow, green, black and a whole lot of shades in between. I stay stocked up as if there was a food shortage ahead of me – luckily they have a very long shelf life. It amazes me how different their tastes are. 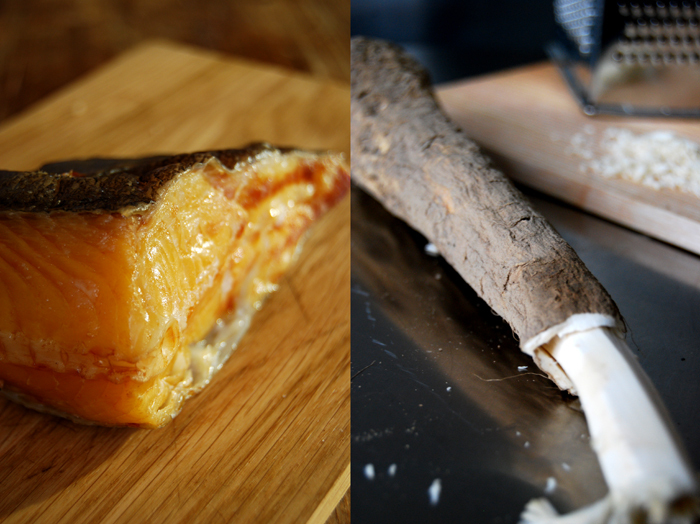 Each has its own characteristic aroma and there are endless delicious combinations with herbs, spices, meat and fish even. I guess that’s the reason why I can’t stop buying them. When I see a kind of lentil that is currently not in my kitchen shelf, I can’t help it, I have to think of what I would cook with them. Then I buy them and here it is: another package of these little legumes in the house. I neglected the red ones for quite a while, without any reason. I noticed while putting some order back into my dried food compartment, my typical January “getting back into gear” motivation. A bit of order helps me to get back into a rhythm after the more relaxed and hedonistic Christmas season. 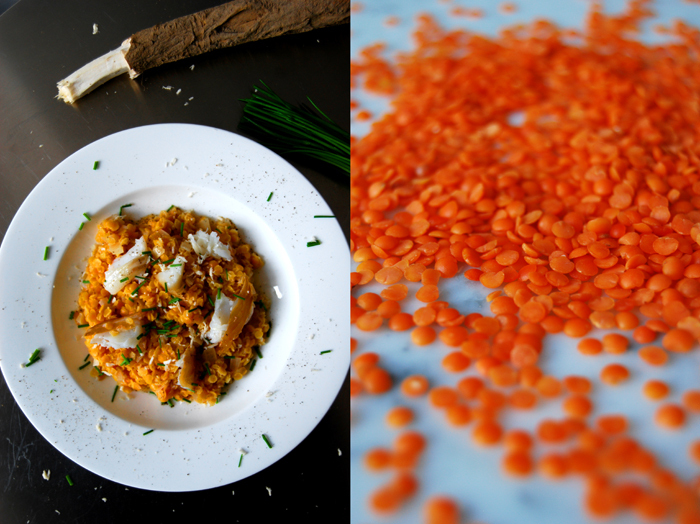 Back to the shelf, the orange lentils glowing right in front of me remind me of a glorious combination of lentils, smoked fish, lemon and freshly grated horseradish. The radish is so spicy that it crawls up my nose which is great to balance out the smoked fish, Halibut in this case, and the unshakeable red lentils, steady and strong, untouched by all these strong companions! Heat a little oil in a large pot and fry the onions for a couple minutes. Add the lentils, the broth, lemon juice and zest and some ground pepper (but no salt!). Cook according to the cooking instructions on your package, mine need 7 minutes. When the lentils are done add the cream and season with salt and pepper to taste. 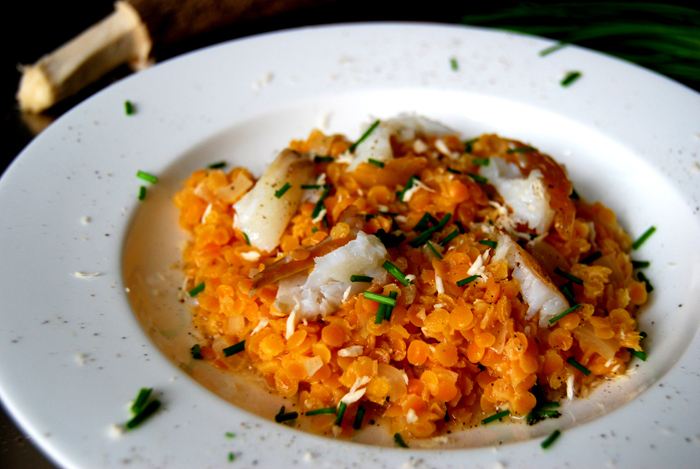 Separate the smoked fish into big chunks and arrange on plates together with the lentils. Sprinkle with horseradish and chives.